Leaves Inspired Tree Nursery – Our selection and service will Leave You Inspired! Our selection and service will Leave You Inspired! Our selection & service will Leave You Inspired! A ball and burlap tree is a tree that has been field grown to a predetermined size. When dug the tree is placed in a wire basket lined with burlap. 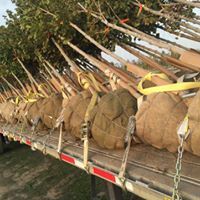 We have burlap balls from 18"-36" depending on tree size. 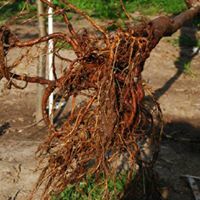 Bareroot trees are dug and stored without any soil around their roots. Trees can be bought "bare root," and planted directly into the ground.